ATV Parts, ATV Radiator Kits, ATV Wheels Tires, ATV Suspension Springs Shocks Bumpers - Wild Boar ATV Parts > Radiator Relocation Kit > Kawasaki Brute Force (2005-2011) Radiator Relocation Kit w/ Screen (Red) $189.00 FREE SHIPPING! « Kawasaki Brute Force 650i/750i (05-11) Radiator Relocation Kit $189.00 FREE SHIPPING! Kawasaki Brute Force (2005-2011) Radiator Relocation Kit w/ Screen (Red) $189.00 FREE SHIPPING! Check out another new item Wild Boar has added! 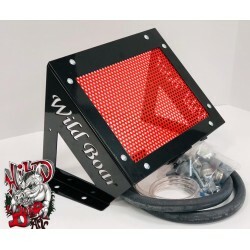 Wild Boar Brute Force Radiator Kit with Red Screen! NOW at LAUNCH Price of $189.00 includes FREE SHIPPING!